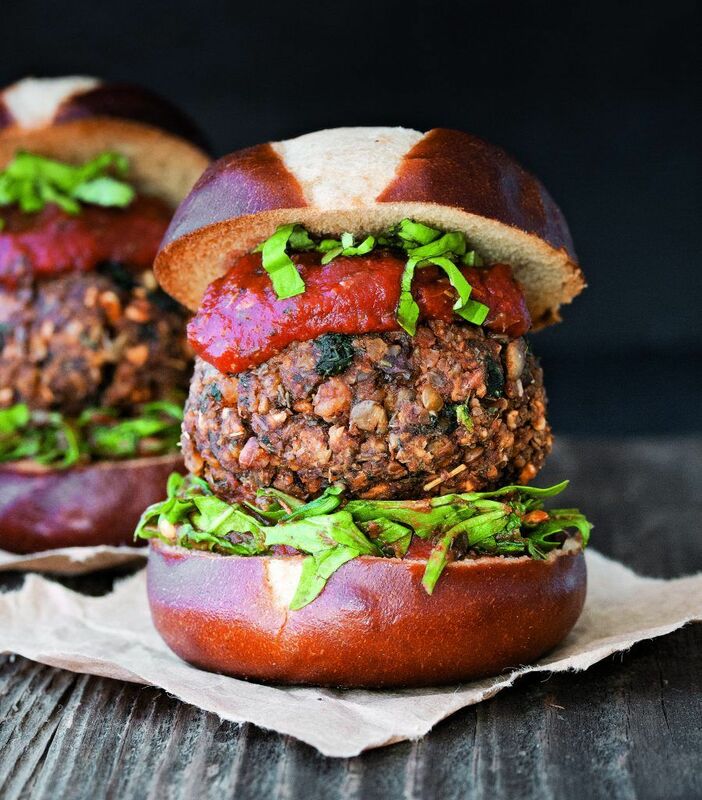 From the first bite to the last, you’ll love the warm, comforting flavor of this hearty vegan meatball burger from Vegan Burgers and Burritos Cookbook by Sophia DeSantis. Say goodbye to dry, boring and overly processed meals and hello to easy, fun and delicious veggie burgers and burritos. 27 Burgers and 26 Burritos to be exact with 19 Sauces and 4 bonus Side Dishes to entice your tastebuds even more! 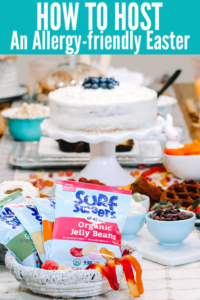 All of which are made from whole, plant-based foods, gluten free, and refined sugar free. Vegan burgers that are chockfull of grains, densely packed nutrients and finished with a smothering of sauce and toppings that will tempt even your meat-loving friends. Which team are you on? You can see from the sweet pic of Sophia and her family above, it’s a tough decision that even they can’t agree on. Currently, I’m on Team Burger, especially after enjoying every bite of this Ultimate Meatball Burger. However, after making the Buffalo Wing Sliders, my children said it was the amazing hot sauce batter that tipped the scale in Team Sauce’s favor. Speaking of sauce, the Ultimate Meatball Burger would just be a burger without a heavy helping of Sophia’s Quick and Easy Pizza Sauce (don’t worry, I included that in the recipe below as well). According to Sophia, “sauce is the frosting on the cake, the chocolate chips on the cookie” and I couldn’t agree more. Why should healthy food be boring? I want to be excited about the foods I am eating and I also want my family to devour it with reckless abandon! This mouth-watering, flavorful patty can easily be mistaken for a real meatball and that’s no joke! It’s a hearty burger filled with mushrooms and greens in addition to loads of protein. 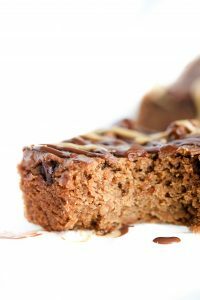 Follow the recommendations for making it gluten-free and if you need to be nut-free like us, then substitute 1/4 cup chopped sunflower seeds in place of the walnuts, like we did. Absolutely delizioso! A deliciously hearty burger to fulfill any meat-lover, topped with the perfect homemade pizza sauce, for an all-in-one type of meal! Place the the lentils, bread crumbs, oats, walnuts/seeds, sauce, thyme, basil, oregano and salt in a food processor and pulse until well chopped. You want a crumble like texture. Check to make sure the mixture sticks together, and if it doesn’t, pulse some more, but make sure it doesn’t turn into a purée. You can also add a bit more pizza sauce if it doesn’t stick yet, however, you don’t want it to be too wet. Place the mushrooms, kale and garlic into the processor, making sure not to add any leftover juices, and pulse a few times until everything is well chopped and incorporated. If the ingredients aren’t mixed after a few pulses, put the mixture in a bowl and mix it with your hands. Place the mixture into a bowl, and put it in the fridge for at least 20 minutes; an hour is best. Making this the day before and letting it sit overnight is optimal. This helps all flavors marinate and leads to a sturdier burger. To cook, shape the mixture into patties. If you’re not using a nonstick pan, then you may want to prepare the pan by brushing it with a tad of oil to avoid sticking. Place the patties in a pan on the stovetop over medium heat for 15 minutes on each side. Pans and stovetops vary, so begin to check the patties at 10 minutes. If you try to slide your spatula under a patty and it won’t give, then it isn’t ready and needs to cook longer. You can also bake the patties on a parchment-lined cookie sheet at 375F for about 20 to 25 minutes on each side. Allow the patties to cool and set for 5 to 7 minutes. Serve on buns with the toppings of your choice. Sauce Notes: This sauce is best if made ahead of time and the flavors are allowed to marinate. This also helps the dried herbs to soften and allows the spices to fully combine with the tomato paste. 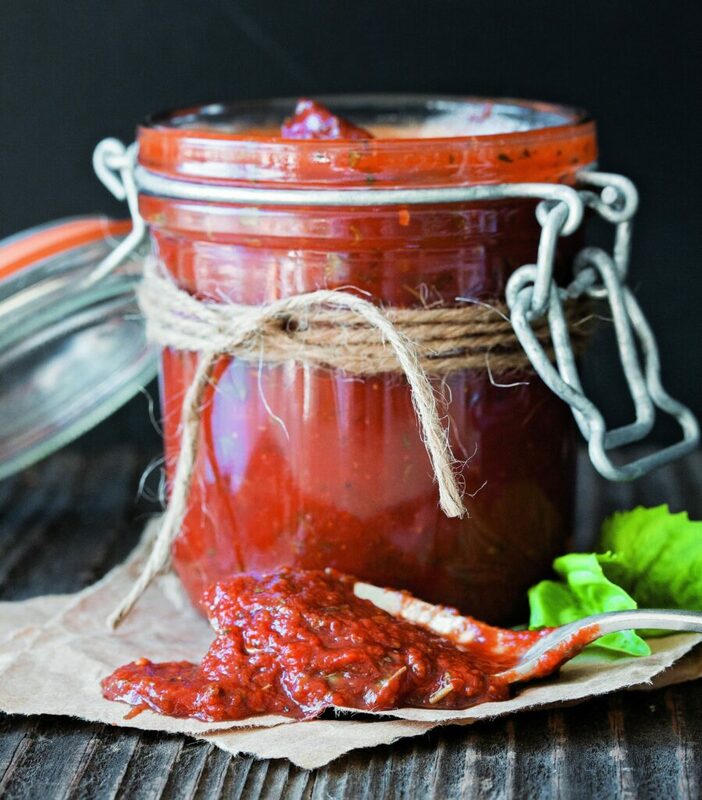 If your sauce seems a little “gritty,”then allow it to sit longer. You can speed this up by heating it slightly. You can use water instead of broth, but the broth adds great flavor. Add more or less broth for the consistency you like. Add more or less crushed red pepper to achieve the level of spice you prefer, or leave it out altogether. I hope you love this Ultimate Meatball Burger as much as we do! 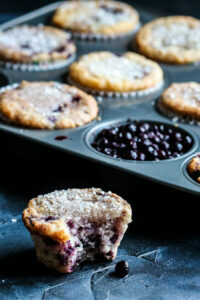 When you give this recipe a try, leave me a comment below with your feedback. Share your photos too! You can find me on Bloglovin, Instagram and/ or Facebook and be sure to tag @allergylicious so I don’t miss it. 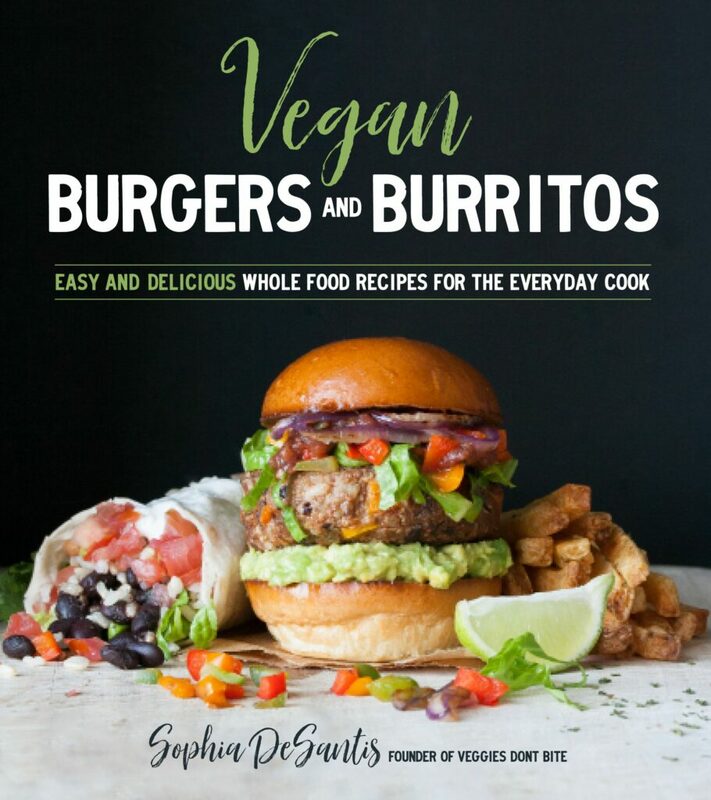 Most importantly, don’t forget to enter the giveaway below for your chance to win of copy of Vegan Burgers and Burritos. Team burger for sure! Yum! 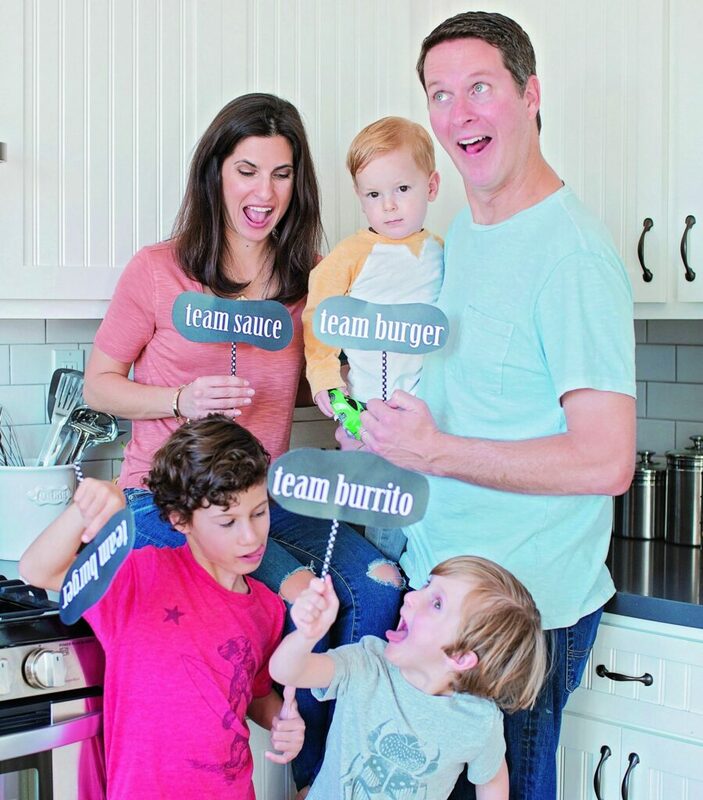 I can’t decide if I would be team burger or team burrito but I don’t think I’ll be let down with either! This has me drooling. It LOOKS like a hamburger! The pics are gorgeous! Sophia does such an amazing job making drool-worthy vegan burgers! All of them make the perfect and delicious combination and they make the perfect team if I have to pick one is team burger. Thanks for the yummy chance 🙂 very generous. They do make the perfect team and so hard to pick one, right? Wow! That vegan meatball burger is STACKED! It looks incredible! Can’t take credit for it unfortunately, but I did eat it all up and it was pretty incredible. Hope you get to try it soon. Did you enter to win the book? Then you can make all of the burgers. This is just a whole lotta wow! I love how monstrous that veggie burger is and can’t believe how healthy the ingredients are. I know! Sophia sure does not disappoint. That is some burger! I love it! I’m definitely team burrito, but I do enjoy burgers too! What’s your favorite burrito toppings Lydia? Where do I even start? My husband is salivating looking at this picture while my mom is exclaiming “What is that?” No one will even miss the meat! That’s the kind of side commentary you want to hear! Can’t I be on 3 teams? I always was an overachiever! This is the most awesome veggie burger I have ever seen! You ARE an overachiever but I love it! We should make a burger burrito drenched in sauce, then we get all 3. This looks so amazing! I don’t think my family would miss the meat, especially with the sauce on top. 2 of my 5 still crave a burger now and when they have a burger like this…it satisfies. I’m team burger but burritos are great too! That patty sound sooo flavorful. I’m usually a burger gal, but I’d go meatless for this recipe! It is a rather large burger! Perfect to share.